Currently viewing the tag: "dogging steinbeck"
Sept. 23-24, 1960 — Deerfield, Mass. Steinbeck and Charley camp Friday and Saturday nights in Rocinante in an apple orchard on a farm on top of the mountain above his son John’s exclusive boarding school, the Eaglebrook School. In “Travels With Charley” he doesn’t say much about his visit or how many nights he spent at Eaglebrook. But in a letter to his wife Elaine, he makes it clear that he was there until Sunday morning, when he woke up late and almost missed church. Later that day he headed north on U.S. Highway 5 into Vermont and New Hampshire. The primitive, uncomfortable 1960 GMC pickup truck/camper combo Rocinante is parked in a place of honor at the National Steinbeck Center in Steinbeck’s hometown of Salinas, Calif.
Steinbeck’s agent, doctor and everyone who loved him tried to talk him out of his trip, which he had been thinking about taking for at least six years. What if he had a heart attack and collapsed in the middle of nowhere? He’d die for sure and he might never be found. He refused to hear such cautionary crap. He was the contemporary rival and equal of Hemingway. He was the World War II correspondent who went on daring midnight raids in PT boats off the Italian coast with Douglas Fairbanks Jr. He was a future Nobel Prize-winner. He may have been born with a heart too small for his big body, as a European doctor once told him. But he was not a famous dead author yet, literally or figuratively. He was still a man – and not an old man. He still had balls. He still had stuff to say and write and prove. 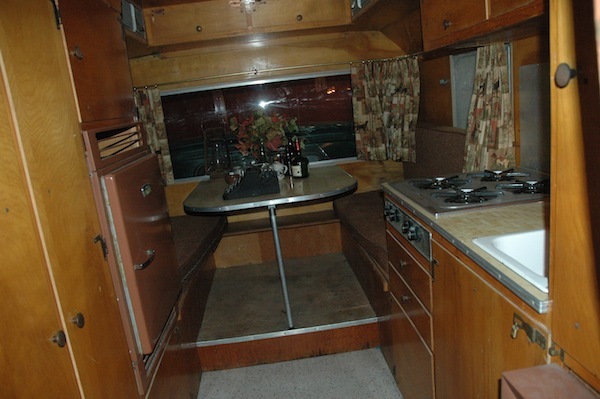 Rocinante’s interior was compact but contained a stove, a refrigerator and a table, like the cabin of a small boat. Steinbeck writes that he left New Hampshire on what would have been Monday, Sept. 26, and drove east across the neck of Maine. He says he stopped at a motel near Bangor but that he was so put off by the sterile and plastic environment in his room that he went out and slept in the back of his truck. In fact, on Sept. 26 he drove 250 miles from Lancaster, New Hampshire, to Deer Isle, Maine, a beautiful little island south of Bangor. He was expected at the seaside home of Eleanor Brace, a friend of his agent Elizabeth Otis. 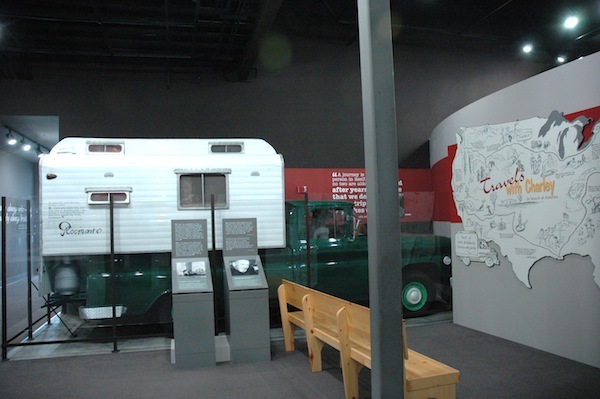 On the Monday night that 70 million Americans watched the first televised Nixon-JFK debate from Chicago, he slept on Brace’s property by the sea in the back of Rocinante. I wanted only to do what Steinbeck did in 1960 – cut through the city of Bangor quickly on my way to the seacoast paradise of Deer Isle, where he spent two days at a gorgeous old house I hoped to find. Driving into the suburbs on state Route 15, the 55-mile trip to Deer Isle became a highlight reel of Maine’s L.L. Bean culture. Boats and RVs of every size, truck caps, kayaks, logs, shingles and gigantic piles of firewood lined the roadside or adorned front lawns. Gas was $2.62 a gallon. The billboard “Guns, Ammo and Camo” pretty much said it all. The closer I got to Deer Isle, the farther back in time I went and the more upscale and artsy-crafty things got. Steinbeck spent two nights at Eleanor Brace’s spectacular house on Deer Isle, Maine, where his agent Elizabeth Otis rented a cottage each year. He visited the quaint fishing port of Stonington, where he buys a kerosene lamp at a nautical hardware store on Main Street. He ate a lobster dinner at Brace’s house with Brace and her woman friend and went to bed early, sleeping another night in his camper Rocinante. In a letter he mailed from Deer Isle to his friend and political hero Adlai Stevenson, Steinbeck said he had heard part of the first televised presidential debate between Richard M. Nixon and John F. Kennedy on Monday, Sept. 26. He was distressed that both candidates were so courteous toward each other. By today’s definitions, Steinbeck was a ball of political contradictions. He was a highly partisan FDR big-government Democrat who went ape for Adlai Stevenson in the 1950s and became a White House-sleepover friend of LBJ and frequent weekend guest at Camp David. Like most of his New Deal generation, he had a naïve trust in the federal government to solve massive social and economic problems. He was a sincere patriot, which, along with becoming too friendly with LBJ, may have blinded him to the folly of Vietnam and the fallacy of the Domino Theory. He was a loud public hawk on Vietnam in its early stages, but became a quiet dove when he realized the war was unwinnable. Intolerant of anti-war protesters, whom he thought were stupid and cowardly, he despised hippies and the ‘60s youth culture. Friday, Sept. 30, 1960 – Lancaster, N.H.
What’s left of one of the Whip ‘o Will cabins is still used as a shed. After sleeping Thursday night in his truck in the middle of Maine’s woods, Steinbeck drives ”long and furiously” all day Friday. He goes south and then west on U.S. 2 to get back to Lancaster, New Hampshire, which he had passed through earlier in the week going east to Bangor. He sleeps in his camper at a ”ghost” motel/lunch counter by the Connecticut River because, though the office is open, no one is around to rent him a cabin. The motel was the Whip o’ Will, which is now trailer court and convenience store. The middle of Maine feels even emptier when the sun is gone. It was dark when I pulled into Millinocket, the lumber mill town where the Pelletier family of “American Loggers” fame lived. After a surprisingly good spinach salad and a beer at Pelletier’s crowded family restaurant/bar, I drove into the black night for the next major town, Milo. In the dark I covered a distance of 39 miles to Milo, but the road I traveled could have been a high-speed treadmill in a tunnel. As far I could tell, except for Brownville Junction, it was deep forest all the way. 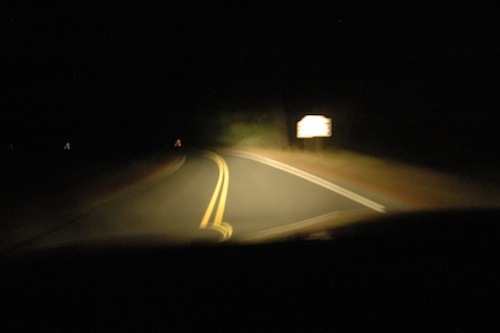 I took photos of the twisting road ahead as I chased its white lines at 60 mph, straddling the centerline through a narrow channel of trees. A few mailboxes flashed by, a house with no lights, maybe a river. My Sirius XM radio, cranked up extra-loud with jazz, cut in and out because of the terrain or overhanging trees, I didn’t know which. I met my third car after 17 miles. In 45 minutes I counted 12. Steinbeck, who slept overnight in his camper shell by a bridge somewhere along Route 11, traveled the same lonely desolate way, but probably in daylight, when the local moose population would have been awake. Maine has 30,000 moose but I didn’t run into one. It doesn’t happen too often in Hollywood, where art and reality go to be tortured and distorted in the name of “good” drama. 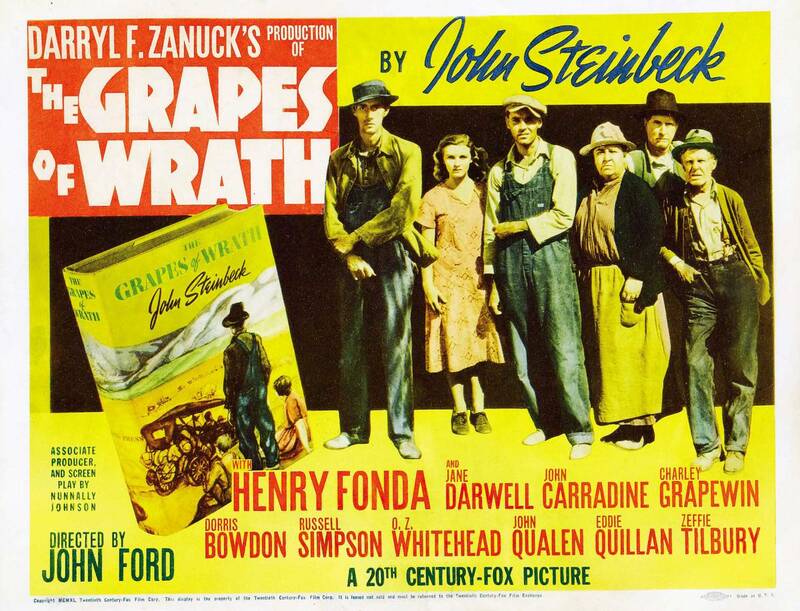 But in 1940 a miracle occurred when Darryl Zanuck produced the movie version “The Grapes of Wrath,” Steinbeck’s mega-selling, culture-shocking, politically correct story of the Okies and Tom Joad. The film version was better. Time magazine’s Richard Corliss does a great job of explaining how that miracle occurred in the latest issue of what’s left of Time. In his essay he reprints the opening paragraph of Time’s original unsigned review of the movie, which premiered 75 years ago Jan. 24 and was written by none other than then-ex-Commie Whittaker Chambers. Chambers’ review, which can be read in its entirety here, shows how sharp he was. Here are the opening paragraphs, which still hold true. The Grapes of Wrath (20th Century-Fox). It will be a red rag to bull-mad Californians who may or may not boycott it. Others, who were merely annoyed at the exaggerations, propaganda and phony pathos of John Steinbeck’s best selling novel, may just stay away. Pinkos who did not bat an eye when the Soviet Government exterminated 3,000,000 peasants by famine, will go for a good cry over the hardships of the Okies. But people who go to pictures for the sake of seeing pictures will see a great one. For The Grapes of Wrath is possibly the best picture ever made from a so-so book. It is certainly the best picture Darryl F. Zanuck has produced or Nunnally Johnson scripted. It would be the best John Ford had directed if he had not already made The Informer. Part of the credit belongs accidentally to censorship and the camera. Censorship excised John Steinbeck’s well-meant excesses. Camera-craft purged the picture of the editorial rash that blotched the Steinbeck book. Cleared of excrescences, the residue is the great human story which made thousands of people, who damned the novel’s phony conclusions, read it. It is the saga of an authentic U. S. farming family who lose their land. They wander, they suffer, but they endure. They are never quite defeated, and their survival is itself a triumph. As I write about in “Dogging Steinbeck,” Time (i.e., Luce) hated Steinbeck because of “Grapes” and bashed him and “Travels With Charley” (though its unsigned reviewer believed it was a true account of Steinbeck’s phony travels). TRAVELS WITH CHARLEY, by John Steinbeck (246 pp. ; Viking; $4.95). Put a famous author behind the wheel of a three-quarter-ton truck called Rocinante (after Don Quixote’s horse), equip him with everything from trenching tools to subzero underwear, send along a pedigreed French poodle named Charley with prostatitis, follow the man and dog on a three-month, 10,000-mile trip through 34 states, and what have you got? One of the dullest travelogues ever to acquire the respectability of a hard cover. Vagabond Steinbeck’s motive for making the long, lonely journey is admirable: ‘To try to rediscover this monster land’ after years of easy living in Manhattan and a country place in Sag Harbor, L.I. He meets some interesting people: migrant Canucks picking potatoes in Maine, an itinerant Shakespearean actor in North Dakota, his own literary ghost back home in California’s Monterey Peninsula. But when the trip is done, Steinbeck’s attempt at rediscovery reveals nothing more remarkable than a sure gift for the obvious observation. It’s not surprising Steinbeck hated Time. My name finally appeared the Guardian newspaper in connection with my Steinbeck exploits, but look at what happened. 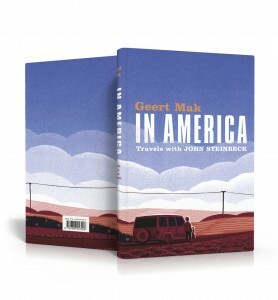 The Guardian reviews Geert Mak’s book about his “Travels With Charley” trip around the USA, which I appear in about 10 times, but it fails to credit me for my expose. The Guardian’s reviewer also falsely accuses me of having a web site for dog-lovers. My barrister will be contacting them. My comment is at the end. It’s nice to see my name in print in the Guardian, but can we get a few things straight — things that my Dutch pal (and ideological opposite) Geert Mak got straight in his fine book. First off, while I am a longtime libertarian newspaperman and columnist, and I did chase Steinbeck’s ghost concurrently with Mak in the fall of 2010, I did not have a web site for dog lovers. That was fellow Steinbeck-chaser John Woestendiek, a Pulitzer Prize winner who used to work for the Baltimore Sun. A minor quibble in a long review, to be sure, but we ex-newspapermen can get picky with our facts. Much more important to me and readers of the Guardian is the failure of the reviewer to credit me and my dogged journalism (on and off the road) for exposing, after 50 years, that “Travels With Charley” was filled with so many fictions and lies that it did not deserve to be called a work of nonfiction. (It had been deceptively marketed, reviewed and taught as a true nonfiction account of Steinbeck’s iconic 1960 road trip since 1962; because of the trouble I caused in newspapers, Reason magazine and in my book “Dogging Steinbeck”, the latest introduction to “Charley” by Jay Parini has been carefully amended to tell readers the truth — that they are about to read a work of BS, I mean fiction. My name was not mentioned by Professor Parini but the paper I was working for was.) Geert Mak — who went out of his way earlier this year to fly from new York City to Pittsburgh to meet me face-to-face — honestly/graciously credited me in his book for discovering, long before he did, the inconsistencies between Steinbeck’s first draft of “Charley” and the published version. I’ve tried many times to get the Guardian’s book people to pay attention to “Dogging Steinbeck”, which was self-published on Amazon and therefore has trouble being taken seriously, or reviewed, by newspapers and magazines. My book contains no footnotes, cracks lots of jokes and looks at 11,276 miles of the Steinbeck Highway from a refreshingly libertarian point of view (i.e., not the standard cliche-ridden East Coast liberal establishment one that Steinbeck had and Mr. Lennon betrays), but it is a serous work of journalism. “True nonfiction”, I call it. The New York Times editorial page and travel writer Paul Theroux were highly pleased with what I learned about “Charley”, its author and the lengths to which Viking Press went to create the myth that Steinbeck traveled alone, traveled rough and traveled slow. Mak gave me credit for my literary expose several times in his book, but Mr. Lennon somehow missed it. Here’s what Mak wrote to me in an email: “I wanted … first to express my personal admiration for the job you did. Second, to tell you that you became a kind of a journalistic hero in my travel-story about Steinbeck, because you did such fantastic detailed research on the subject, and you did it alone, in sometimes-difficult circumstances”. Readers who want all the crazy details of my road trip, my expose and my pain in trying to get “Dogging Steinbeck” the attention it deserves can go to Amazon or my web site, www.truthaboutcharley.com, which is not about dogs.